It’s important that we qualify any statement about the “original” Rambler by referring to “the original Nash Rambler,” for the Nash compact was not the first car to bear that name. The Thomas B. Jeffrey Company of Chicago, Illinois built the first prototype Rambler automobile in 1897. Jeffrey was a former bicycle manufacturer who took a fancy to the idea of the automobile, still a radical idea in the Gay Nineties. Jeffrey built bicycles under the Rambler trade name, but did not apply that name to a production automobile until 1902. By that time, the company had moved to a new headquarters in Kenosha, Wisconsin. The Rambler automobile was neither particularly small nor very cheap. Its low-line models were around the price of an early Cadillac, while the most expensive model was $2,500, a great deal of money for the time. The early Rambler did feature two novelties that would later become commonplace: a front-mounted engine and a steering wheel rather than the more customary tiller. The car sold reasonably well in a fledgling market. Thomas Jeffrey died in the spring of 1910 and his son Charles assumed the presidency of the company. Charles Jeffrey took the company public for the first time and grew its business significantly. In 1914, he decided to abandon the familiar Rambler name and re-brand the company’s automobile the Jeffrey. However, Charles Jeffrey’s interest in running the company would be short-lived. In May 1915, Charles survived the sinking of the ocean liner RMS Lusitania by a German U-boat. After that terrifying and traumatic experience, he decided to leave the auto business for good and a year later arranged to sell his company to former GM executive Charlie Nash. Charles Warren Nash had, along with David Dunbar Buick, been one of the original founders of the Buick Motor Company. After the formation of General Motors, Nash remained with Buick, which became a GM division. When GM’s creditors forced out corporate founder William Crapo Durant in 1910 (an event discussed in our biography of Henry Leland), Nash became Buick’s president. The board named him president of GM in 1912, but Nash resigned in May 1916 after Billy Durant succeeded in regaining control of the corporation. About two months later, Nash concluded a deal to purchase the Thomas B. Jeffrey Company for around $10 million. In 1917, he renamed that company Nash Motors. In the mid-thirties, Nash Motors merged with the Kelvinator appliance corporation. Aside from diversifying his business, one of Charlie Nash’s principal goals in that merger was to secure the services of Kelvinator’s talented president, George W. Mason, whom Nash had selected as his successor. In 1937, Mason became president of the new Nash-Kelvinator corporation, although Nash remained board chairman until his death in 1948. Mason was a big man, over 6 feet tall (over 1.8 meters) and close to 300 lb (137 kg), but early in his Nash career, he took a strong interest in small cars, which would eventually become the company’s specialty. The impetus for the compact cars actually came from Nash’s engineering vice president, Nils Erik Wahlberg, and chief engineer Meade Moore. Back in 1935, they had developed an experimental compact car with a four-cylinder engine and unitized construction. Although it would be many years before Detroit embraced unit bodies, their engineering advantages were well-known in engineering circles and several of the independent body companies, including Briggs and The Budd Company, were already promoting the idea. George Mason was not an engineer, but he was a savvy businessman who well understood that to survive against bigger Detroit rivals, Nash needed every competitive advantage it could get. Wahlberg and Meade convinced him of the virtues of unitized construction and secured his authorization to retool the Nash assembly plant in Milwaukee, Wisconsin, to produce unit bodies, which represented an investment of some $7 million. Nash also recruited several engineers from Budd, including Tedd Ulrich, an ex-GM engineer who had worked on the Vauxhall Ten and Opel Olympia, GM’s first unit-bodied cars. Ulrich would play a key role in the development of the unitized 1941 Nash 600 and Nash’s later small cars. While Moore and Wahlberg had clearly thought about compact cars even before World War II, Moore said later that the inspiration for what became the compact Nash Rambler came from his war-related work in Hartford, Connecticut, in 1942 and 1943. Before the war as now, many cars were used mostly for short trips and commuting, but by 1943, gasoline was rationed and pleasure driving was prohibited, which made anything but short drives impractical. Nonetheless, most of the cars on American roads were enormous by any reasonable standard — the smallest of the “Low-Priced Three” in 1941 had been almost 195 inches (4,950mm) long — and quite thirsty. Considering the prevailing conditions, Moore found that absurd and started contemplating the development of a smaller, more economic car for urban driving. Moore shared these thoughts with George Mason, who supported the idea enthusiastically. Mason recognized the logic of Moore’s argument, but what most excited Mason was the prospect of offering a product the Big Three couldn’t match. Mason’s enthusiasm was by no means universally shared among Nash’s executive staff or even its engineers. However, it did prove enticing to the president of the Automobile Manufacturers Association (AMA), George Romney, who in 1948 accepted an offer to join Nash-Kelvinator as Mason’s special assistant. Romney said later that he had concluded during his tenure at the AMA that there would be a strong market for compact cars and that Nash’s plans in that regard led him to accept Mason’s offer over a far more lucrative one from Packard. With Mason and Romney’s support, Nash would pursue not one but two compact car programs. 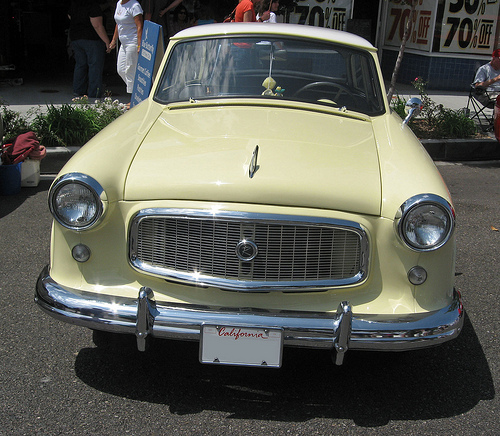 One, Bill Flajole’s NXI project, became the Nash Metropolitan. The other became the 1950 Nash Rambler. Mason was presumably aware that the Big Three had indeed contemplated compact cars both during and shortly after the war. Chrysler’s four-cylinder Project A-106 didn’t get far enough to have made much news, but Ford and Chevrolet had actually announced tentative production plans for their respective “Light Car” projects. Chevrolet’s Cadet (developed by Earle MacPherson) didn’t make it due to materials shortages and cost overruns, while the Ford Light Car was sold to Ford’s French subsidiary to become the 1949 Vedette and was never sold in the U.S. in any significant numbers. Why? The original goal for the Big Three compacts was to offer models less expensive than the manufacturers’ existing standard cars, whose prices had been steadily escalating even before the war. However, it quickly became clear that it would be impossible to build even a conventionally engineered compact (much less one as advanced as the Chevrolet Cadet) for significantly less money than a standard-size car, which meant that selling the compact for less would mean smaller profit margins. Worse, since Chevrolet and Ford already dominated the low-priced field, a smaller, cheaper model would steal sales from the bigger and more profitable cars. Faced with that dilemma, the Big Three abandoned the compact idea until the import boom of the late fifties forced the issue. Nash-Kelvinator was in a very different position. Mason calculated that any small cars Nash sold would likely be conquest sales, luring buyers away from the Big Three with a product the larger companies couldn’t match. However, Mason and Romney were conscious of the price issue, which was no less a concern for Nash than it had been for Chevrolet. Mason and Romney considered that problem and concluded that it would be a mistake to market a small car based solely on low price. Doing so would slash profit margins to the bone while condemning the product to Spartan interior trim and a down-market ambiance that would make it less desirable to all but the most skinflint buyers. (Indeed, that proved to be the fate of Kaiser-Frazer’s compact Henry J, developed at roughly the same time.) Instead, Mason felt they could promote the compact as a rational alternative for urban driving, focusing less on price than on virtues like ease of parking and greater fuel efficiency. Mason wanted to position the compact Nash as a well-trimmed, upscale second car for local trips, a companion to a full-sized car in the same way a ship’s boat might complement a yacht. An obvious side benefit of that approach would be a higher list price and significantly healthier per-car profit margins. That was crucial because the compact’s $13 million development cost was a big investment for Nash, which was doing relatively well financially, but didn’t have the deep pockets of General Motors. The new compact’s development was overseen directly by Meade Moore, who remained one of the few senior engineers who really believed in the concept. The body structure was primarily the work of Ted Ulrich, who apparently also dictated much of the styling. George Walker, who was a design consultant for Nash until 1946, later denied any involvement with the Rambler, as did several of Nash’s own stylists, who told author Michael Lamm that the design of the compact Rambler was based more on engineering blueprints than any real aesthetic vision. Like the big Nashes of the time, the compact Rambler was a fully unitized design using what Nash called “Airflyte” construction. The main distinction was that unlike the contemporary Nash Ambassador and Statesmen, the Rambler carried its engine and front suspension on a reinforced crossmember rather than a bolt-on subframe. The Rambler was all-steel except for the upper part of the door frames, which were extruded aluminum and had integral window channels. In production form, the Rambler rode a 100-inch (2,540mm) wheelbase and stretched 175.8 inches (4,465 mm) overall, making it roughly the size of a modern C-segment car (e.g., Honda Civic). Despite the heavy cast-iron engine, curb weight was a modest 2,430 lb (1,102 kg), although the body structure was quite stout. Mason didn’t want to launch the car as a mundane two- or four-door sedan and in any case, the engineers were initially skeptical that they could create a viable four-door on the 100-inch wheelbase. In keeping with the Rambler’s intended prestige image, the sole body style available at launch was an unusual convertible landau with a retractable fabric roof, a style more recently revived for the FIAT 500c. Turning a unit-body automobile into a convertible is challenging because a monocoque vehicle’s roof is an important structural element. That was particularly true of the Rambler, which had stiff side beams in the roof just above the doors to stiffen the body structure. Rather than sacrifice the roof beams, Ulrich opted to retain fixed door frames and simply incorporate tracks for a retractable roof panel. The canvas top was power-operated by a simple electric winch, rolling back into the trunk in the manner of a roll-top desk. The Rambler’s engine was the same flathead six used by the old 600, a larger version of which powered Nash’s full-size cars. In the compact, the engine displaced 173 cu. in. (2,828 cc) — big by modern compact standards, but modest for contemporary American engines — and made 82 gross horsepower (61 kW). A three-speed manual was standard, with overdrive the only transmission option. The Rambler’s suspension was largely conventional, with double wishbones and coils in front and Hotchkiss drive in back, but the front suspension had unusual high-mounted springs, sitting on top of each upper wishbone and acting against the inner fender structure. The purpose of the unconventional spring placement, later adopted by other Nash cars (and subsequently used by Ford for some of its U.S.-market unitized cars, including the first Ford Falcon), was to improve ride quality by reducing front unsprung weight and facilitating the use of longer, softer springs. The consequence was a very low static roll center, which combined with the fairly high center of gravity to make the Rambler feel top-heavy in brisk cornering, especially since there were no anti-roll bars. The Rambler’s other handling oddity was caused by the enclosed front wheels. 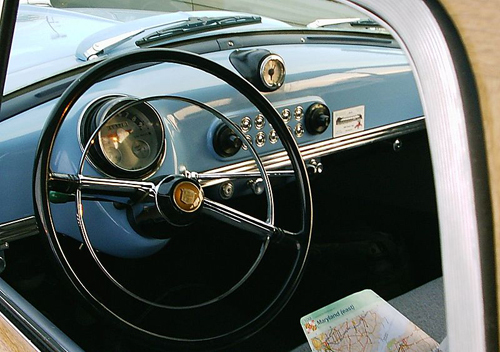 This feature was introduced on the 1949 full-size cars for aerodynamic reasons, but it made tire-changing more difficult and limited steering lock, resulting in an inconveniently large turning circle. Nash engineers and stylists were unhappy with the enclosed wheels, but George Mason was stubbornly committed to them, feeling that the enclosed wheels, like Cadillac’s fins, helped to provided immediate identification of all Nash models. 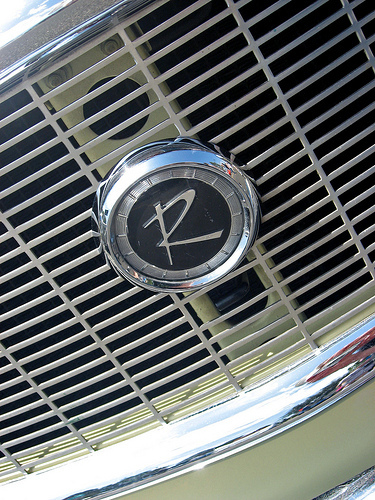 Since Nash’s bigger cars were called Statesman and Ambassador, George Romney suggested the name “Diplomat” for the new compact. Unfortunately, that name had already been registered by Chrysler, which would use it on and off for many years. 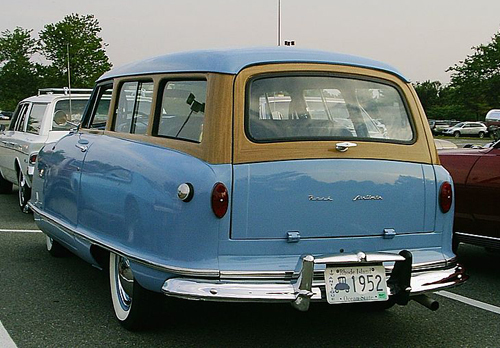 As an alternative, Nash looked back to the company’s roots and revived the name Rambler. 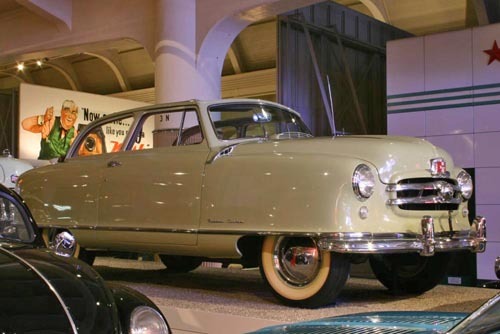 The Nash Rambler went into full production in February 1950 and made its public debut in early April. The landau convertible came only in what Nash called Custom trim, which included plush upholstery (styled and selected by former Paris fashion designer Helene Rother), turn signals, courtesy lights, and wheel covers, features that were optional on even most American luxury cars of the time. Even more unusually, the Rambler included as standard pushbutton radio and Nash’s excellent “Weather Eye” thermostatically controlled heater. About the only thing not included as standard equipment was overdrive, a worthwhile extra at about $100. On a Ford or Chevrolet, the Rambler’s load of accessories would have cost $200 to $300 above the list price. Automotive and consumer reviewers were enthusiastic about the new Rambler, which was not only economical, but well-appointed, comfortable, and surprisingly sprightly. Tom McCahill of Mechanix Illustrated, the first independent reviewer to test the car (he’d spotted the development mules on the Nash proving grounds months before introduction and persuaded engineers to let him drive one), recorded 0-60 mph (0-97 km/h) times of less than 17 seconds and estimated a top speed of 84 mph (135 km/h), very respectable for the time. Those figures, measured with a stopwatch and an uncorrected speedometer, were undoubtedly optimistic, but the little Nash actually had a fractionally better power-to-weight ratio than did a 1950 V8 Ford. As for economy, Nash’s claim of 30 mpg (7.8 L/100 km) was a trifle optimistic, but an overall average of 25 mpg (9.4 L/100 km) was very good for the early fifties and about 30% better than the Low-Priced Three could offer. The Rambler’s main dynamic shortcoming was handling. The soft springs and abundant body lean did not encourage vigorous cornering and the Rambler’s enclosed front wheels made maneuvering in tight spaces cumbersome. Still, it rode well, which was more important to contemporary American buyers than high-speed cornering. The Rambler didn’t have an abundance of leg room, but it was relatively wide, so it had reasonable space for four. Luggage space was another matter; the Landau’s trunk held both the spare and a shield to protect the fabric top, leaving little space for baggage. As with a modern Mazda MX-5 Miata, the Landau was fine for commuters, but it didn’t lend itself to either major shopping expeditions or long trips. In June 1950, Nash added a two-door Rambler Custom station wagon, priced at the same $1,808 as the Landau. The Landau was cute, but the wagon was genuinely useful, not only for families, but also for small businesses that needed a handy and economical vehicle for local deliveries. (Nash later introduced a slightly cheaper Deliveryman model aimed at precisely that market, although the Deliveryman was not well-publicized and sold in limited numbers.) It may have helped that it was also the only wagon Nash offered in that era. 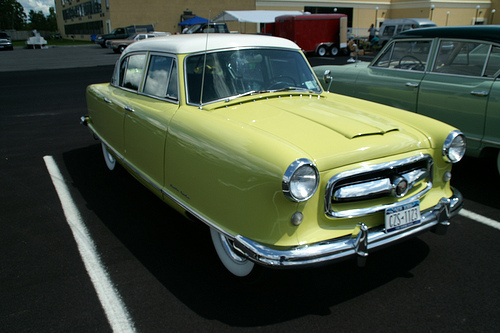 The Nash Rambler’s 1950 sales were limited by the late introduction and shortages of raw materials. At the time, the U.S. government still controlled strategic resources like steel, which were allocated to automakers based on market share. (This was one of the many reasons for the collapse of the independent automakers in the early fifties.) Still, Nash sold about 11,400 1950 Ramblers, which wasn’t a bad start. The temptation to add a basic two- or four-door sedan was no doubt strong, but Mason stuck to his policy of offering what he called “fringe models.” The next Rambler model added after the wagon was the Custom Country Club hardtop coupe, priced at $1,968. In a concession to economy, a cheaper Suburban wagon with Super trim was also added for 1951, priced $108 below the Custom wagon. Rambler sales climbed to around 70,000, accounting for about a third of Nash’s total sales. The Rambler may have lured some shoppers away from the bigger Statesman line, but Nash volume was up almost 34,000 units for 1951, so Mason was apparently correct that the compact would attract new customers. 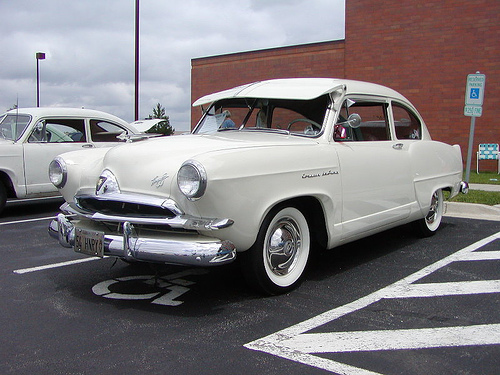 However, the Rambler was not the best-selling U.S. compact in 1951, having been eclipsed — albeit briefly — by the new Henry J that went on sale in September 1950. The Henry J’s starting price was about $400 less than the Rambler’s, although in comparison, the compact Kaiser was a penalty box. These encouraging numbers tumbled worryingly the following year, as the entire U.S. auto industry took a sharp downturn. The principal reason was the Korean War, which led to government production restrictions. Automakers and the Automobile Dealers Association convinced the Department of Defense that completely shutting down civilian auto production was unacceptable, but manufacturers were capped at around 80% of their 1950 output. Raw materials shortages continued to be a problem, as did strikes at automotive suppliers. 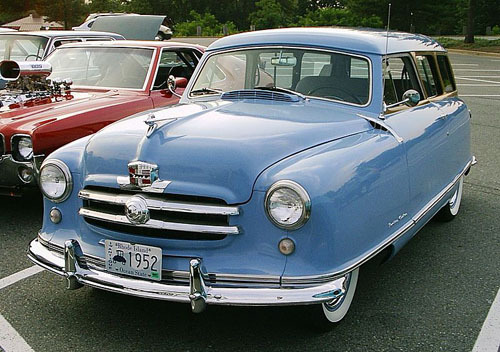 As a result, Nash sales were down significantly for 1952 and Rambler sales fell to about 53,000. Higher prices may not have helped — even the cheapest Super Suburban wagon now listed for more than $2,000. Even so, the Rambler outsold the Henry J, which managed only about 35,000 sales for 1952, and the new Aero Willys, which sold about 32,000 units. Sales for 1953 were even worse, although the Korean War ended that summer and most of the labor and supply issues were resolved. The problem this time was not competition (although the new Hudson Jet joined the fray that year), but a brutal price war between Ford and Chevrolet. Ford, eager to regain its former dominance of the low-price field, pumped up its output by nearly 90%. Dealers, stuck with excess inventory, resorted to steep discounts and aggressive sales tactics to move the metal. Chevrolet took this as a declaration of war and responded in kind. The independent manufacturers — Hudson, Nash, Kaiser, Studebaker, et al — already had slimmer margins and simply could not afford to keep up with this blitz. As a result, Nash Rambler sales slumped to 31,790 despite a restyling, bigger engines, and the availability of automatic transmission (GM’s Hydra-Matic). Nash’s overall sales fell nearly 20%. For 1954, Mason finally agreed to introduce the cheaper models he had long resisted, including a simple two-door Nash Rambler sedan in plainer Deluxe trim, priced at a modest $1,550. Heater and radio were no longer standard on all Ramblers, although air conditioning was a new option. More significant was the introduction of four-door models: a Custom sedan and a Custom Cross Country wagon with a “Fashion Safety Arch” roof (designed by stylist Bill Reddig) and standard roof rack. Because Ted Ulrich and Meade Moore continued to insist to Mason and Romney that they couldn’t build a practical four-door on the 100-inch wheelbase, the four-door cars rode a 108-inch (2,743mm) wheelbase and stretched 186.4 inches (4,735 mm) overall. Despite the new models and reduced prices (thanks to reduced standard equipment), 1954 sales weren’t much better than 1953’s, totaling 36,231. Only 221 of those sales were the Landau, which had been overshadowed by the more practical hardtops and wagons. The Landau was discontinued at the end of the year. 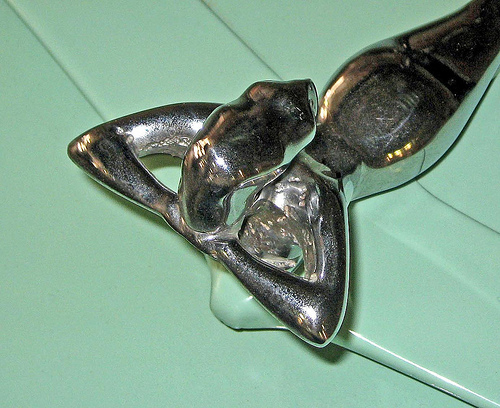 One of the more unusual Nash options in this era was a “Petty Girl” hood ornament, designed by famed pin up artist George Petty. It was introduced on big Nashes earlier in the decade and became available on Ramblers in 1953. It’s seen here on a 1957 Rambler station wagon. Mason knew even as the 1954 models went on sale that Nash could not survive the onslaught of the Big Three alone. He had been pushing for a merger with Hudson, Packard, and Studebaker since 1946 and now the matter was becoming urgent. Both Packard and Studebaker still demurred, but Hudson realized they no longer had a choice. In January 1954, the Hudson board voted for the merger with Nash, forming the American Motors Corporation. Since Nash-Kelvinator was in a much better financial position, it became the dominant half of AMC, with Mason as president and George Romney as executive vice president. They moved swiftly to consolidate Nash and Hudson production, which began to converge with the introduction of the 1955 models that fall. Hastily re-skinned Nashes replaced the big Hudsons, but there was neither time nor money to facelift the Rambler or subcompact Metropolitan. Instead, AMC resorted to simple badge engineering, selling identical models with both Hudson and Nash emblems. In the fall of 1954, Mason was hospitalized with acute pancreatitis. He developed pneumonia and died on October 9. With his death, George Romney was left in charge of American Motors, which also ended hopes of adding Packard to the mix. Both Romney and Packard’s president, James Nance, were too ambitious to cede control of their respective companies and it was clear that the two men would not be able to coexist comfortably. Ordinarily, badge engineering does nothing good for sales, especially for companies already in trouble, but sharing the Rambler with Hudson paid off for AMC. It may have helped that both the Henry J and Hudson Jet were dropped after 1954, eliminating two major competitors, but in any event, Nash sold 56,023 1955 Ramblers. Hudson dealers moved an additional 25,214, accounting for a high percentage of AMC’s combined sales. The success of the Rambler gave George Romney bold ideas. He had always been more committed to compact cars — that was why he’d joined Nash in the first place — and he was now convinced that they were the wave of the future. Most auto execs in Romney’s position would have retrenched in the big-car market and either dropped the Rambler or let it languish and die a natural death. Indeed, many at AMC wanted to do just that. Rather than invest in new tooling for the ailing full-size cars, however, Romney opted to redesign the Rambler line for 1956, making it somewhat bigger — about 8 inches (203 mm) longer overall — but still firmly in the compact class. The 1956 Ramblers were still unitized, but they were a good deal more contemporary in style, with taller windows, more glass area, trendy wraparound windshields, and some bizarre two-tone paint jobs. Romney decided to drop the short-wheelbase models entirely, consolidating all Ramblers on the longer 108-inch (2743mm) wheelbase introduced in 1954. Overall length was up to about 191.1 inches (4,854), curb weight to between 3,100 and 3,300 lb (1,400-1,500 kg). Passenger space wasn’t much better than before, but the trunk of the sedans was usefully larger. The 1956 Ramblers also traded the old car’s Hotchkiss rear suspension for a torque tube on coil springs and adopted a modern ball-joint front suspension. The optional 196 cu. in. (3,205 cc) engine got a new overhead-valve head that pushed power to 120 hp (90 kW) and power steering was added to the options list. Despite all these changes, Rambler sales dropped to 66,573 for 1956. The peculiar styling might have had something to do with that, but buyers were also understandably concerned about the company’s future — AMC lost $19.7 million in 1956. Still, the Rambler accounted for close to half of AMC’s total volume. By then, Romney had already decided that the Nash and Hudson brands were doomed. The 1957 Ramblers no longer carried either badge and were simply badged as “Rambler.” In November 1956, the AMC board agreed to terminate Nash and Hudson; since AMC sold 91,469 Ramblers and fewer than 10,000 Nashes and Hudsons in 1957, the decision was not a difficult one. Starting in 1958, all AMC cars would be badged as Ramblers. 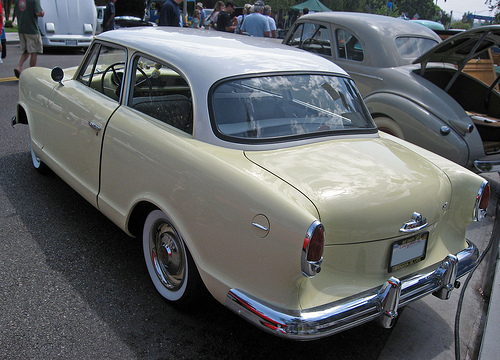 By 1958, the Rambler had drifted considerably from its original mission as a compact commuter car. It was still small by American standards, although it was bigger than a full-size Mercedes of the time. Starting in 1957, the Rambler could even have a V8, a new 327 cu. in. (5,354 cc) engine with 250 gross horsepower (187 kW). The V8 added 275 lb (125 kg) to the nose and reduced fuel economy by more than 20%, but the bigger engine boosted sales. The 1959 Rambler Six, seen here in Custom sedan trim, is 189.5 inches (4,813 mm) on a 108-inch (2,743mm) wheelbase, weighing around 3,100 lb (1,406 kg). Its 196 cu. in. (3,205 cc) six had 127 hp (95 kW), or 138 hp (103 kW) with the optional two-barrel carburetor. The Rambler was a good deal smaller than a full-size Chevrolet, Ford, or Plymouth of the time, but was bigger than the subsequent Big Three compacts. At $2,383 to start, its price was very close to Chevrolet’s Bel Air or the full-size Ford Fairlane. In 1958, AMC restyled the entire Rambler line and added a new “full-size” model: the Ambassador, reviving the name of the previous top-of-the-line Nash. While the new Rambler Ambassador was over 200 inches (5,096 mm) long on a 116-inch (2,946mm) wheelbase, weighing more than 3,700 lb (1,678 kg), it was basically a standard Rambler from the firewall back; the extra length and longer wheelbase did nothing for interior space. John Conde later said the Ambassador had been created purely as a concession to AMC’s own executives, some of whom found the idea of driving a compact Rambler Custom or Rebel too humiliating to contemplate. George Romney regarded the Ambassador — which was precisely the sort of “Detroit dinosaur” he’d come to publicly decry — with bemused chagrin. As if in penance, Romney reintroduced the 100-inch (2,540mm) wheelbase to the Rambler line for 1958. Now called Rambler American, it was essentially a revival of the discontinued 1955 two-door with new styling by Anderson and Reddig. It was a rather pretty little car, actually more Italianate than the Pininfarina-badged Nashes of the early fifties. This is a 1960 Rambler American Deluxe two-door sedan, which at $1,795 was the second cheapest of the Rambler American line. (There was also a business sedan with no rear seat for $14 less.) Powered by the same 196 cu. in. (3,205 cc) flathead six introduced for Hydra-Matic cars back in 1953, it had 90 gross horsepower (67 kW). Despite the earlier protests of Ted Ulrich and Meade Moore that it was impossible to build a four-door sedan on the short wheelbase, there was eventually a four-door version of the Rambler American. With the reintroduction of the Rambler American, AMC now had models in three distinct sizes, something that the Big Three wouldn’t be able to match until the mid-sixties. This coincided with the onset of the Eisenhower recession of 1957–58, which sent buyers fleeing from thirsty, over-styled big cars to smaller, more economical compacts and imports. 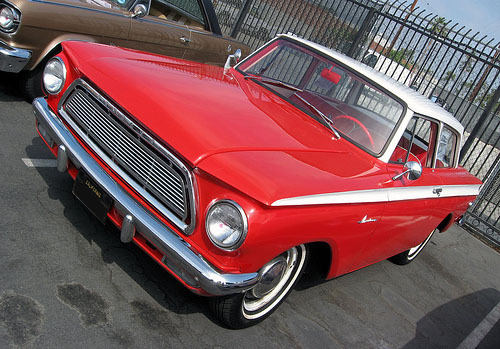 Rambler sales climbed to 131,542 for 1958 and the company made a profit for the first time since the merger. The Rambler American sold well throughout this period: 91,491 in 1959 and 120,603 in 1960. It was redesigned in 1961 with squared-off styling and sold even better, moving more than 136,000 units that year. That was particularly impressive considering the proliferation of new compacts from other manufacturers, who joined the fray in 1960. 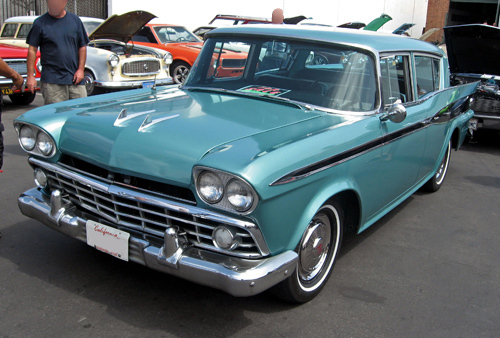 Although it has new sheet metal, the 1958–1960 Rambler American is very similar to the 1955 short-wheelbase Nash Rambler — it was built using much of the same tooling. Styling, by Edmund Anderson and Bill Reddig, is quite pretty, although the depth of the wheel wells, a relic of the former enclosed wheels, is disconcerting. Although the Rambler American is the size of a modern compact, its packaging efficiency is mediocre; the wheel arches and rear axle intrusion cut into rear-seat room. The American retained its 100-inch wheelbase through 1963. By that time, Romney had parlayed the success of AMC into a political career and Roy Abernethy had taken over the running of the company. The redesigned 1964 Rambler American, released a year or so after Romney became governor of Michigan, adopted a longer 106-inch (2,692mm) wheelbase and new styling, developed by design chief Richard A. Teague. The bigger American sold well at first — more than 160,000 units in 1964 — but then began a slow decline through the rest of the decade before expiring in dramatic fashion in 1969. Abernethy moved gradually away from both the Rambler name and its compact economy-car identity. Starting in 1967, he began to phase out the Rambler nameplate in favor of AMC (although export models were still called Ramblers well into the seventies) and by 1970, AMC’s cars were no longer significantly more economical than their Big Three rivals. The first Nash Rambler was ahead of its time in more ways that one. Its unusual front suspension design was widely imitated (principally by Ford Motor Company, which applied a very similar format to the Ford Falcon, Fairlane, Mustang, and Maverick). George Mason’s marketing strategy, meanwhile, was applied with great success to the plush Chevrolet Corvair Monza and Ford Falcon Futura of the sixties. With its modest exterior dimensions, unibody construction, and small(ish) engine, the Nash Rambler is also a good deal closer to a modern car than are most of its contemporaries. This is a base-model (Deluxe) 1962 Rambler American two-door sedan, the third generation of the short-wheelbase Rambler. It’s the same size as before — 173.1 inches (4,397 mm) long on a 100-inch (2,540mm) wheelbase — but a new OHV version of the 196 cu. in. (3,205 cc) six offered up to 120 gross horsepower (90 kW). Base price for this model was $1,846. More significantly, the Nash Rambler demonstrated that there was a market for a well-appointed, comfortable small car, even if it didn’t have a rock-bottom price. That is a lesson that Detroit has been very reluctant to learn over the years, but if you doubt it, look at how many current B- and C-segment cars now come standard with equipment like air conditioning, power windows, and keyless entry. Today, you can buy a Honda Civic, Volkswagen Golf, or Ford Focus that is more lavishly equipped than most high-end luxury cars of 20 years ago, and that’s not counting premium-branded models like Mercedes’ A-Class or the BMW 1-Series. We may not have George Mason and George Romney to thank for that, but we can’t deny that they were there first. Our sources included the Auto Editors of Consumer Guide, “1950-1952 Nash Rambler,” HowStuffWorks.com, 28 August 2007, auto.howstuffworks. com/ 1950-1952-rambler.htm, accessed 22 August 2009, “1953-1955 Nash and Hudson Ramblers,” HowStuffWorks.com, 29 November 2007, HowStuffWorks.com.com, auto.howstuffworks. com/ 1953-1955-nash-hudson-rambler.htm, accessed 21 August 2009, Encyclopedia of American Cars: Over 65 Years of Automotive History, (Lincolnwood, IL: Publications International, 1996), and Cars That Never Were: The Prototypes (Skokie, IL: Publications International, 1981); Arch Brown, “1941 Nash 600: Bristling with innovations, this pre-war economy car offered excellent value,” reprinted in The Hemmings Book of Nashes: driveReports from Special Interest Autos magazine, ed. Richard A. Lentinello (Bennington, VT: Hemmings Motor News, 2002); “1965 Rambler Classic V-8: Shedding the Little Old Lady Image,” Special Interest Autos #63 (May-June 1981), reprinted in The Hemmings Book of Postwar American Independents: driveReports from Special Interest Autos magazine, eds. Terry Ehrich and Richard Lentinello (Bennington, VT: Hemmings Motor News, 2002); “SIA comparisonReport: 1935 Pontiac vs. Nash,” Special Interest Autos #97 (January-February 1987), reprinted in The Hemmings Book of Nashes; “The Man Behind the ‘600’: George W. Mason,” Special Interest Autos #60 (November-December 1980), reprinted in ibid; “Why Studebaker-Packard Never Merged With AMC and other revelations by Governor George Romney,” Special Interest Autos #66 (December 1981), pp. 50-55; Arch Brown, Richard Langworth, and the Auto Editors of Consumer Guide, Great Cars of the 20th Century (Lincolnwood, IL: Publications International, Ltd., 1998); John A. Conde, “Golden Anniversary Nash,” Special Interest Autos #46 (July-August 1978), and “Rare Pair: Twin 1948 Nash Convertibles,” Special Interest Autos #37, (November-December 1976), reprinted in The Hemmings Book of Nashes; Patrick R. Foster, American Motors Corporation: The Rise and Fall of America’s Last Independent Automaker (Minneapolis, MN: MBI Publishing Company, 2013), and “Personality Profile: Edmund Anderson: A Stylish Line,” Collectible Automobile Vol. 19, No. 5 (February 2003), pp. 67–77; Dave Holls and Michael Lamm, A Century of Automotive Style: 100 Years of American Car Design (Stockton, CA: Lamm-Morada Publishing Co. Inc., 1997); Charles K. Hyde, Storied Independent Automakers: Nash, Hudson, and American Motors (Detroit: Wayne State University Press, 2009); John Gunnell, ed., Standard Catalog of American Cars 1946-1975, Rev. 4th Edition (Iola, WI: Krause Publications, 2002); John F. Katz, “SIA comparisonReport: Independent Thinking: 1954 Nash Rambler, Willys Aero, and Hudson Jet,” Special Interest Autos #159 (May-June 1997), reprinted in The Hemmings Book of Postwar American Independents; Michael Lamm, “1950 Nash Rambler: America’s First Successful Post-war Compact,” Special Interest Autos #24 (September-October 1974), reprinted in The Hemmings Book of Nashes, and “Two Look-Alikes: Ford & Citroen” in Special Interest Autos #9 (January-March 1972), reprinted in The Hemmings Book of Prewar Fords: driveReports from Special Interest Autos magazine, ed. Terry Ehrich (Bennington, VT: Hemmings Motor News, 2001); and Bill Vance, “Motoring Memories: Nash Rambler, 1950-1955,” Autos.ca, 18 December 2008, www.autos. ca/ motoring-memories/ nash-rambler-1950-1955/, accessed 21 August 2009. We also consulted the following period road tests: “’56 Rambler Road Test,” Motor Trend January 1956; “Car Life Consumer Analysis: 1956 Rambler,” Car Life April 1956; “Driver’s Report: The 1957 Rambler,” Motor Life December 1956; James Whipple, “Car Life Consumer Analysis: 1957 Rambler,” Car Life February 1957; Joe H. Wherry, “America’s New Economy Car,” Motor Trend February 1958; Jim Whipple, “Speed Age Expert Test: Jim Whipple Tests the 1958 Rambler,” Speed Age February 1958; “Ambassador Road Test,” Motor Life June 1958; “Rambler Ambassador Road Test,” Motor Life January 1959; Doug Blain, “Wheels New Car Tryout: Poetry and This Year’s Rambler,” Wheels March 1959; “Road Test: Rambler American: Sometimes a step back is a step ahead,” Road & Track March 1959; “Testing the 60’s: he heart of a big car behind the personality of a compact: Rambler V-8” and “Testing the 60’s: Rambler American: a new look at the most experienced of the compacts,” Motor Life February 1960; “Road Test: Rambler Six: Romney’s compact Rambler, the one that started it all,” Road & Track February 1960; “Full Range Road Test: The Rambler Classic V-8s,” Motor Trend February 1961; “Road Test: Rambler American,” Motor Trend May 1961; “Rambler American,” Car Life November 1961; “Rambler American,” Car Life November 1961; “Car Life Road Test: Rambler Ambassador 400: a potential bargain in not-quite-compact form,” Car Life May 1962; “Car of the Year: Rambler Classic and Ambassador” and Wayne Thoms, “Rambler American: American Motors’ original compact still rolls strong,” Motor Trend February 1963; and “Rambler American: An improved Rambler is nobody’s Car of the Year in ’64,” Car and Driver April 1964, all of which are reprinted in AMC Rambler Limited Edition Extra 1956-1969, ed. R.M. Clarke. (Cobham, England: Brooklands Books Ltd., ca. 2004); and Floyd Clymer, “The Owners Report on the Nash Rambler,” Popular Mechanics January 1950, pp. 141–145, 258–260; Devon Francis, “Meet the ‘Ramble,'” Popular Science May 1950, pp. 110–114; and “Nash Rambler,” Popular Mechanics May 1950, p. 105, which are not. Background on Thomas B. Jeffrey came from Jeffrey’s Wikipedia® entry (en.wikipedia.org/wiki/Thomas_B._Jeffery, accessed 21 August 2009); and the Wikipedia entries for the company (en.wikipedia.org/wiki/Thomas_B._Jeffery_Company, accessed 21 August 2009) and Charles W. Nash (en.wikipedia.org/wiki/Charles_W._Nash, accessed 21 August 2009); Arch Brown, “Timely Exit,” Special Interest Autos #115, January-February 1990, reprinted in The Hemmings Book of Nashes; Beverly Rae Kimes, ed., Standard Catalog of American Cars 1805-1942, Second Edition (Iola, WI: Krause Publications, Inc., 1989); and “The Jeffrey Four,”a Wisconsin Historical Society, www.wisconsinhistory. org, accessed 21 August 2009, which includes a facsimile of the 1916 Jeffrey brochure. My grandmother had a 1961 Rambler American when I was a small boy. I remember it seemed so small when compared to all the full size cars of that era. For an American car, it was. It was a middling family car by contemporary European standards, and it’s roughly the size of a modern Honda Civic or other C-segment sedan. Doug could be my cousin! My grandmom had a ’61 American as well, a red & white two-tone 4dr sedan. 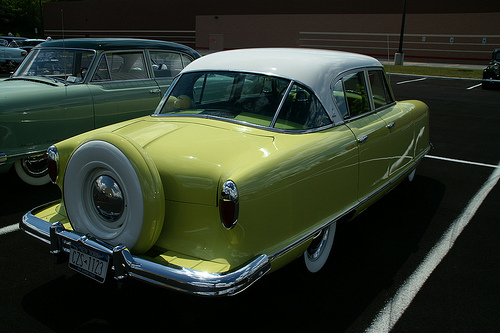 Her husband, my granddad, bought a dark-green 1954 Nash Ambassador new and kept it until the day he died in April 1966. Matter of fact, he died driving it. Nan had the presence of mind to drive from the center front and get the car stopped, by which time the massive heart attack Gramp suffered had taken his life. I remember riding in that car, it was cavernous, quiet and smooth. Nan kept the ’61 American until a stroke in 1988 forced her, at age 91, to give up her license and sell the 27-year-old car. It was in showroom condition. Gramp’s mechanic, who thought the car was junk in 1961, couldn’t wait to buy it in 1988 for $500. A very well researched and written article. I was unaware how the wheel arches were opened up only after George Mason’s death. I always thought of Ramblers and eventually AMCs as somewhat odd cars, but I guess that’s because they were. And that is why I always liked them. I always liked something different, something everyone else doesn’t have. And let’s face it, you can’t get much different than these cars. My dad bought a used 1961 Rambler American to drive to work so he could save gas and park the barge. He paid $100 for it and sold it two years later for $120. It never failed to get him where he was going but it used more oil than gas. It looked like mosquito control… I called it Smokey the Bear. I don’t think I can ever remember my uncle driving anything but an AMC. 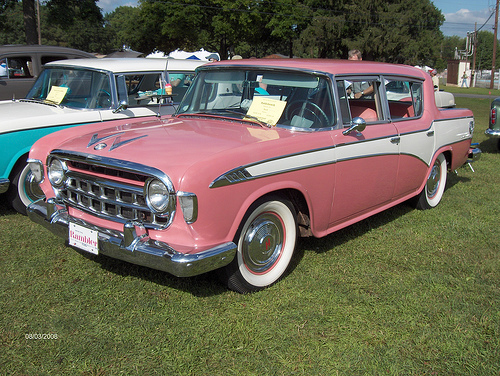 My earliest memory of a Rambler was a 1956 model driven by an old lady in the town where I grew up. It was maroon and white. I don’t know why but I fell in love with that car. Maybe because it was different. I’ve wanted one ever since. I have owned several really neat old cars over the years but never an old Rambler like that one. Until now. It took me fifty years but I finally bought one. It’s a 1956 Hudson Rambler Deluxe with 60,000 miles on it. It’s in pretty good shape but not perfect. It’s a project. And it’s my pride and joy. Good article, my family and later I had a total of 8 over the years. One correction, they had lower ball joints but what is called the upper one is actually a trunion which is more like a three sided universal joint than a ball joint. The unavailability of this part which hasn’t been available for almost 40 years is why there are 20 times more old Studebakers around today as opposed to Ramblers which outsold Studebaker 3 to 1. The beautiful ’58 Ambassador 4dr hardtop that graces my desktops wallpaper is so rare there are only 2 left in the world. PS, I have just found out they are available again after not being available for years, too late to help all of the cars that have been scrapped over the years. This article brought back happy memories of my grandfathers 1959 Rambler Super four door sedan. It was painted dark green with contrasting light green accent spears below the tail fins. I can still see myself sitting in the back seat with my grandfather driving and my grandmother backseat driving. They were quite a pair. In retrospect, the 1956-57 Ramblers are the most elegant looking; i could swear a hint of Peugeot in the styling.The 1958-59 standard Super and Ambassador sedans are styled to suggest the 5 We had a family friend, a Honduran haircutter who owned a light blue ’59 Super, and he used to remind me of a fat chicken. So for a long time, I believed these latter 50’s Ramblers were the ugly duckling AMCers, seeing Fat Michael, our duck walking friend, drive and own one, but now, I love these 1958-59 “Fat Michael” styled Ramblers, particularly the Ambassadors. Ugly goes to what we got in 1960. The all time ugliest cars ever designed, the 1960 Rambler Classic, a yellow rat of a car. A used car salesman at a swap meet(I had a ’64 Barracuda I was showing) wanted to unload one of these dogs on me. Of course, I flatly refused. How Rambler made it to nine more years, and the 1960 models somehow failed to get AMC six feet under is my guess to this day. My brother’s cousin(we have different family sides) owned a white 1960 Classic, and perhaps because he was such an untrustworthy yellow rat of a man, snd probably it rubbed off on the styling, although the styling cracks mirrors itself, this is why I hate the 1960 Classics. The Americans stood pat, and were more pleasant to the eye all through the sixties. I have been trying to find a 1963 rambler that was taken from me. It was the light green. Had bench seats (black and white small stripes) the shifter was on the steering wheel. In 73 was painted a med. blue. The engine was a flat head 6. I loved this car and would like to find it and try and by it back. Was taken in Denison, texas. There was a great funny little song about a Little Nash Rambler that took on a Cadillac from about the 60’s. Recently found the 45, played it, and we all enjoyed the heck out of it Seeing these photos today was great. That would be “Beep Beep” by the Playmates, released in 1958. First: thank you for this enlightening article! I am the happy owner of a 1955 Nash Rambler Super, 2 tone blue/white. I am originally from France, I own a few Citroen cars and wanted a mid 50 US car as I love the style and colors along with the opulence. But I wanted a “compact” (by US standards!) that would fit in my garage, preferably a car that kind of stood out at meets and this is how I came across this car and the history/story of Charles Nash…..it all made for a dream come true since 2002. I drive it a lot, about 3,000 miles/year and get many thumbs up as well as questions since it does “stand out” which is somewhat surprising here in northern Illinois since they were built not too far North of here in Kenosha, WI….yet, this brand and this model are not well known.